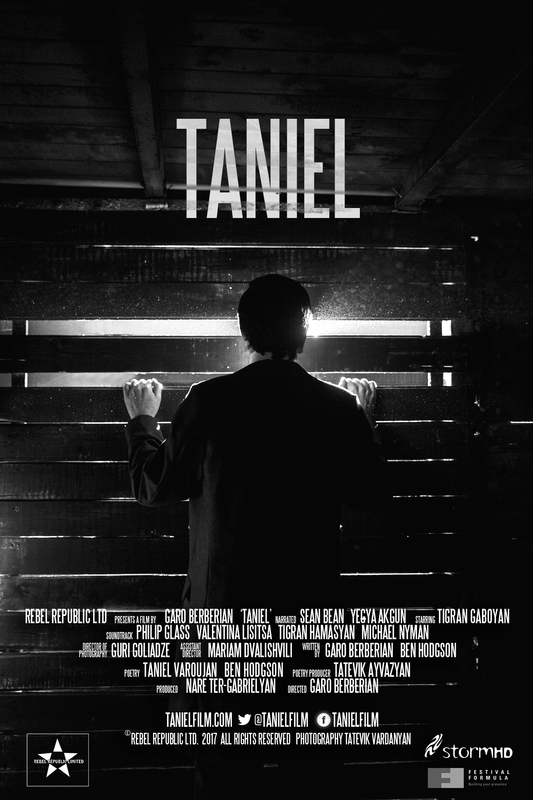 Garo Berberian’s “Taniel” is no ordinary film. 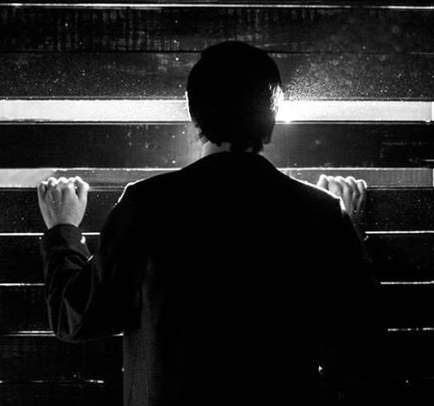 It uses dark, elegant Film Noir images and a poet’s tragic personal story – voiced through poetry of Varoujan in Armenian and Ben Hodgson’s in English, and does not fit any conventional definitions. Filmed in the Armenian town of Gyumri and in Portsmouth, writer and director Garo Berberian combines his love of Film Noir and arthouse filmmaking to create an exquisite, moving tribute to the majestic man and poet: “When you are dealing with tragic events in history we tend to lose sight of the individuals concerned, their personalities, expression, feelings and loves, and I wanted to focus on someone that offered so much and asked for little”. He says that he wanted to film in Istanbul – Taniel’s Constantinople, but it was obvious this was going to be impossible in the present political climate, and he was off to Armenia and Gyumri, the city had all the locations needed and most importantly many creative and talented people. ”Working with the theatre in Gyumri was a real pleasure, not only were they consummate professionals but they were a joy to work with, focused on the art of acting and the importance of representing one of our greats. I feel the films strengths are through its cast, their faces and their understanding of Varoujan’s pain, our pain, it was something we all shared and understood, this is not something that needed to be talked about.’’, says Garo. Tigran Gaboyan, one of Armenia’s brightest stars, embodies Varoujan in the film. “Playing Varoujan has been my baptism in the film world. And I was lucky to get baptised in a great group of creative people. And it was wonderful and hard to play Varoujan, a poet I love and a person who embodied a whole nation’’. Yeğya Akgün is the voice of Taniel, keeping the authentic Constantinople accent of his Western Armenian poetry alive. ‘‘While making the film, we were conscious of our great responsibility in making a short film of such a talented man and by recording of his poems, in the city that he lived, on the land where he was born we hoped to regain life in the beauty of his work. It is a sincere source of happiness for me to be a part of this project, with deep respect for his memory…”, says Yeğya. Sean Bean’s magnificent voice is narrating the film through Ben Hodgson’s poetry. It was hard to get into a diary of an actor of Sean’s calibre, in between filming in Central America and Italy, in a small recording studio near his West Country home, we were able to sit down with Sean and record “Taniel’s” voice. It was a privilege to work with a professional like Sean, who was kind and intelligent, taking direction and contributing greatly with his understanding of the poetry, its rhythm and emotion. Sean brought Ben Hodgson’s poem “Indelible” to life, giving a challenging subject warmth and emotion and the film – a voice to be proud of. Music by Philip Glass played by Valentina Lisitsa sets the scene of World War 1 with heartfelt minimalist tones. Tigran Hamasyan and music from the album “Luys i Luso” are the driving force across the film with his complex and emotive cascade of notes and vocals, and Michael Nyman with his “Out of the Ruins” score builds and develops the feeling of tragedy and ultimately resurrection. Tatevik Ayvazyan, the films poetry producer, says that it is wonderful to be involved in a film celebrating our one of our majestic, innovative poets, whose ideas of beauty, peace and love are still alive and relevant. ”He was an artist, transcending national boundaries, and while he loved Armenia, he wrote for mankind, singing their pain, beauty and desires’‘. She also says that it was extremely important that Varoujan’s glorious, rich Western Armenian sounds we hear in the film is endangered language now and needs to be heard, spoken, preserved and loved. Taniel is currently taking part in the film festival circuit through 2018. It won two awards at the Bermuda International Film Festival and is selected to be screened at a few more currently, including Shetland’s Screenplay Festival, curated by Mark Kermode. The film’s creative team is just back from Armenia: there were two screenings at the Golden Apricot film festival, which was a great opportunity to meet film fans, journalists and fellow filmmakers and share the film with them. There were also further screenings in Gyumri, where the cast and crew were reunited with the director, and at Tumo Creative Technologies Centre. There was also a very special, emotional screening and poetry reading session at the Armenian Genocide Museum-Institute, which was an amazing honour and very well received by the audiences. The film continues its journey around the globe, artfully showing the audiences the tragic loss of life of a beautiful poet, accompanied with his own words.